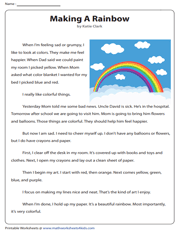 Compiled here is a collection of printable 3rd-grade reading comprehension worksheets featuring thought-provoking stories, poems and informational texts with visually appealing illustrations that grab the attention of children at once. Kids refer explicitly to the text to answer the questions, determine the moral of a text, distinguish between literal and non-literal language, describe the chief characters and read the passages with grade-appropriate accuracy and expression. Have you ever had an unusual pet? The child in the poem has one, who is all ears to the child's stories. 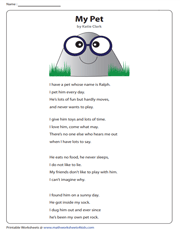 Read the poem to find out who it is and help kids answer questions and analyze the character of the child as well. The informational text has many interesting facts. Kids learn to derive answers from the text and add the suffixes -er and -est to make the comparative and superlative degrees of a few adjectives. It's a lot easier than it sounds. This story is going to cast a spell on you with its mysterious setting. 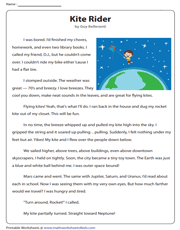 The printable ELA worksheet introduces idioms and elicits responses based on the story. 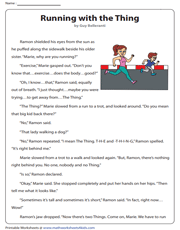 Read the story to figure out what 'the Thing' actually is! 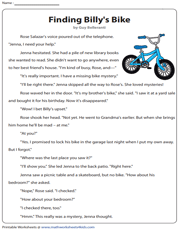 Jenna sets out when Rose needs help with the missing bike. 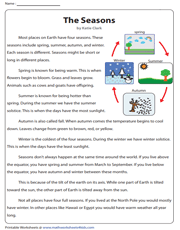 The printable 3rd-grade worksheet introduces an important Common Core aspect in reading comprehension: "making explicit reference to the text", among other questions. Colors have always fascinated kids and life without them would be boring! Find textual evidence to support arguments and equip kids with a few antonyms using the comprehension questions featured in this PDF. 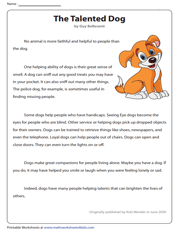 This informative piece has it that dogs make great friends for people. With a wide range of questions, including sentence formation, the central message, and finding evidence, this is more than engaging. Caught between exhilaration and compassion, Mousy is a little confused. This grade 3 worksheet first interests with an MCQ, before it intrigues with some inference and "moral" questions. Here, the child is thrilled to bits, but the thought of not being able to see his parents sends shudders down his spine. This worksheet is engrossing, with questions as diverse as T/F, MCQ, and reflecting on the story. Thanks to its precision, Autumn has turned out to be an astounding work of art. Here's a great help in finding and masterfully using topic-specific words, part and parcel of the Common Core Standards for reading. 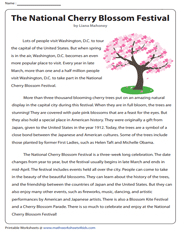 The National Cherry Blossom Festival attracts many tourists to New York. 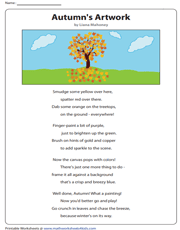 What makes this grade 3 worksheet a class apart is, kids learn a beautiful metaphor. Another interesting aspect is adverbs. 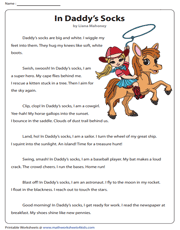 This is a refreshing take on a child's fancy about its Daddy's socks. 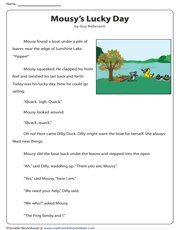 In the reading comprehension worksheet, children test how well they can make inferences from the text, learn yet another idiom and attempt questions based on the passage.